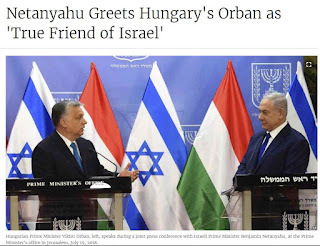 So, for example, despite its antisemitic history (and certainly antisemitic beliefs there are still widespread), synagogues in Hungary now do not need police protection like they do elsewhere in Europe. Of course, a major part of the reason for this is that, unlike other European countries Hungary has few Muslims - primarily because Orban has refused to give in to demands for Hungary to take their share of the millions of recent 'migrants' who happen to come from Islamist countries. And it is because of this refusal - and his insistence on protecting his country - that he has incurred the wrath of leftists all over the world including Soros and the Board of Deputies, because in their minds this makes him 'Islamophobic'. 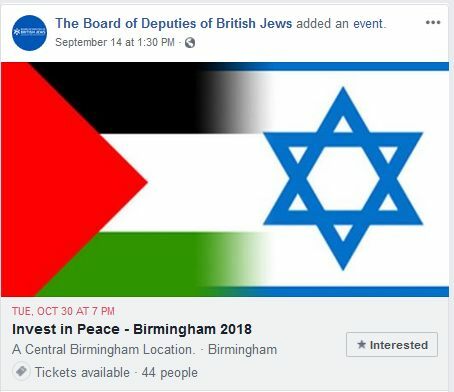 But what has this got to do with the Board of Deputies of British Jews anyway? This is where it gets interesting. 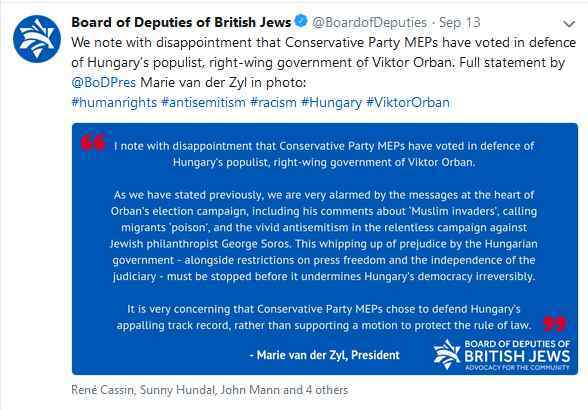 Notice that their statement includes the vicious and bizarre libel that Orban is also antisemitic on the basis that he and his party have campaigned against "Jewish philanthropist George Soros". 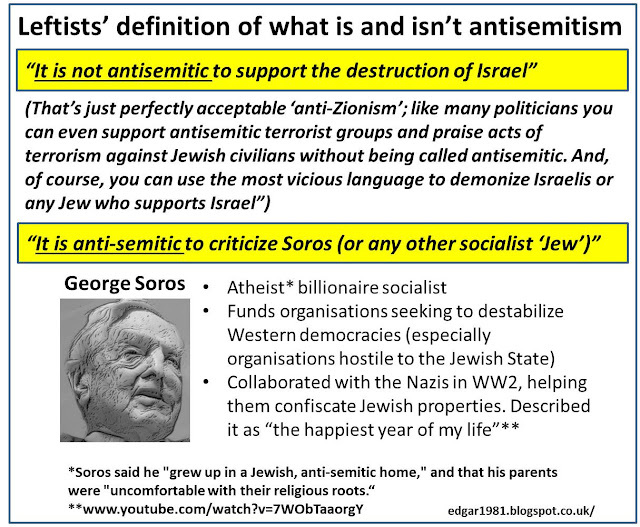 Ah now that would be the extreme leftist Soros who actually renounced his Judaism long ago, worked happily for the Nazis during WW2, and spends many of his millions of dollars funding organisation dedicated to the destabilization (and eventual destruction) of the State of Israel - as well as attempts to remove from power any governments - like Orban's - that do not buy into his globalist leftist agenda (which is why Orban has tried to stop Soros meddling in Hungary's internal affairs). I would treat Hopkins and Robinson with extreme caution. 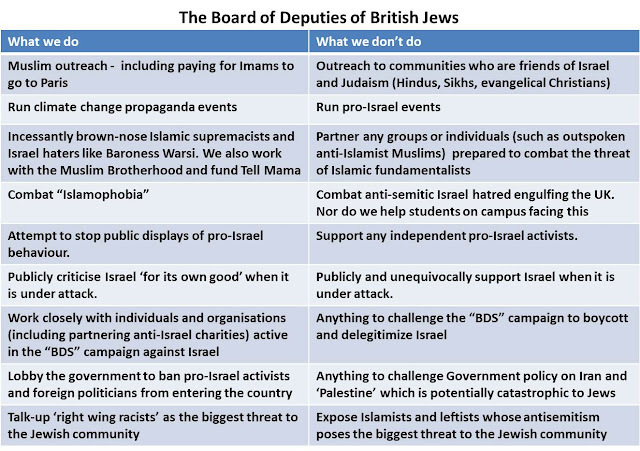 They are the 'friendly', 'reasonable' faces of the right that hide a much darker ideology. Corbyn plays a similar role for the regressive left. Your comments about the BoD are spot on. 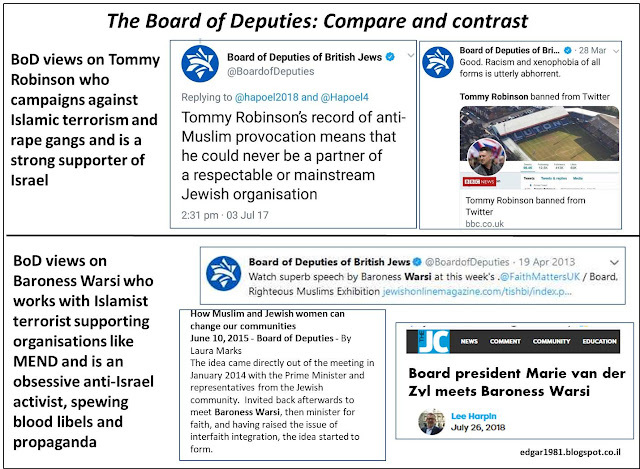 I believe you are completely wrong about Hopkins and Robinson. The idea that they hide some #much darker ideology' is exactly the nonsense put out by the BoD.